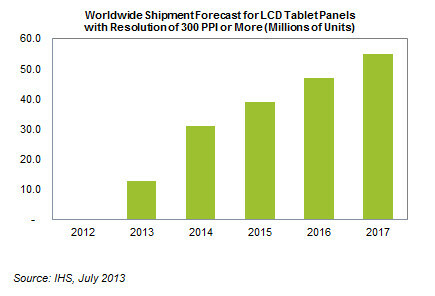 IHS estimates a shipment of 12.6 million LCD tablet panels with 300-ppi-or-higher resolutions in 2013. 300 ppi LCD panel shipment have only started in this year. “Tablet makers want to differentiate their products, increase their market presence, boost demand and improve their profitability by offering high-performance displays,” said Sweta Dash, senior director for display research at IHS. “Display suppliers are supporting this trend with increased production of higher-pixel-density LCD panels that employ the latest technologies to pack more pixels into every inch of screen space. This will create a whole new class of displays with 300 ppi and higher resolution that will represent the new high end for the tablet business.” Further market study points disclosed by IHS includes: Pixel proliferation The new 300-ppi class will join existing 200-ppi categories to form a freshly expanded line of high-resolution displays. And while shipments of such panels will keep growing and increasingly rule the tablet space, lower-resolution panels of 100-150 and 151-200 ppi will see their markets decline or remain flat over the years. Prior to 300 ppi, the highest resolution for tablets was in the 251- to 300-ppi range, where Apple’s 9.7-inch iPad 4 and the 9.0-inch Barnes & Noble nook HD+ belong. Panel shipments for this resolution segment are forecast this year to reach 67.2 million units, up 47 percent from 45.7 million in 2012. Below that segment are tablet panels in the 200- to 251-ppi range, home to the 7.0-inch Amazon Kindle Fire HD and the 10.0-inch Google Nexus 10. Panel shipments here are projected this year at 22.8 million units, up 88 percent from 12.1 million. SID and fancy displays Examples of the new 300-ppi panel for tablets could be seen at the recent Society for Information Display (SID) conference in Vancouver, a prominent industry event where panel manufacturers discuss new technologies and advances in the field. At the event in May, LG Display showed a 7-inch high-definition tablet panel of more than 300 ppi, while rival Samsung Electronics countered with a 10.1-inch 300-ppi tablet panel. Taiwan’s Innolux also had its own offering—a 6-inch high-definition, low-temperature polysilicon panel at 368 ppi. Some of the new high-resolution displays slated for release this year will make use of oxide thin film-transistor (TFT) technology, similar to what was glimpsed at SID. The technology is considered a next-generation solution for panels, due to the mechanism’s high transparency and low power consumption. Notebook panels also to benefit High-resolution displays will also be coming to LCD panels for notebook PCs, judging from the SID exhibits. Samsung unveiled a 13.3-inch notebook PC panel with 275 ppi—higher than the 227 ppi of the much lauded 13-inch Apple MacBook Pro with Retina Display. Meanwhile, LG Display presented a 14- inch notebook LCD panel featuring 221 ppi. For the notebook business in particular, where sales have suffered as consumers defected to smartphones and tablets, high-resolution displays could be what mobile PC manufacturers need to entice consumers to replace their older laptops. The new displays can be deployed to make products stand out from the rest of the field, create new demand among consumers, and boost revenue and profitability, IHS believes. In line with the theme of higher performance, glass companies were likewise at SID to demonstrate glass substrates, an important component of LCD panels, for enabling next-generation displays. Both New York-based Corning and Japan’s Asahi Glass announced glass substrate products at the show, formulated for high-performance displays intended to improve quality and productivity.